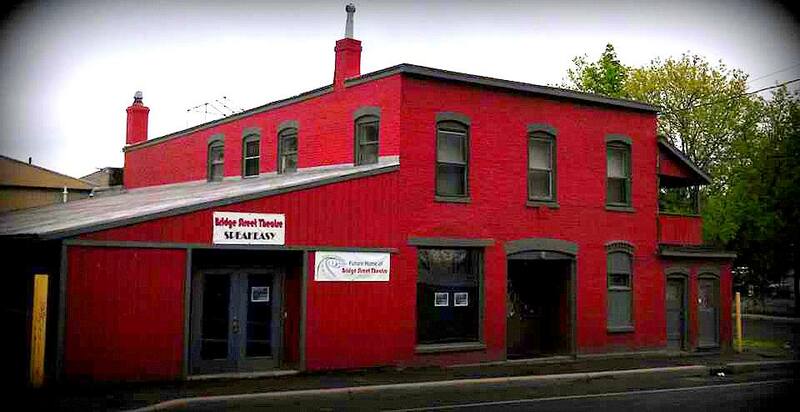 We are now the proud owners of a warehouse building at 44 West Bridge Street in Catskill, NY (just west of the Uncle Sam Bridge) and are on our way to convert it into a small theater space of our own called the Bridge Street Theatre. Click here to view our new Bridge Street Theatre web site. 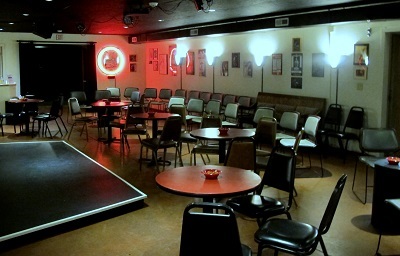 We have converted the future lobby in the Speakeasy and are presenting all kinds of performances there, most every weekend. Check out the Bridge Street Theatre website for all the details. The space was originally a brewing company, then a factory which produced Curtron curtains for freezers, and most recently a book distributing operation. Here's where the stage will be. Interior restructuring should be completed next year and anyone who'd like to pitch in to help will be more than welcome! We’re eventually hoping to present seasons of our own, special engagements by artists from far-flung locations whose work we admire, as well as working extensively with students from the Catskill Unified School District (the building backs up on the parking lot for Catskill High School) to give them practical, hands-on experience in all phases of performance and production. Aiming for an inaugural full season by the year 2015, which we plan to dedicate to the life and work of Oakley Hall III and the legendary Lexington Conservatory Theatre which operated here in Greene County from 1976-1980. We definitely hope the theatre will play a large part in the revitalization effort of the Village of Catskill, and of the area west of the bridge in particular, and will be a boon to area theater-goers, local businesses, and to other small troupes in the Hudson Valley and environs without permanent performance spaces of their own. 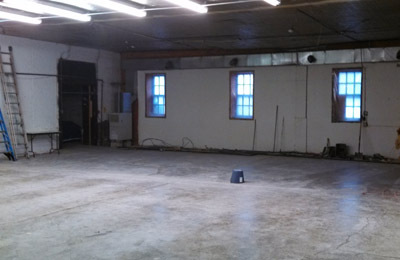 Here's a link to more photos which show the current space and renderings of the future theatre. Steven just completed two productons, The Epic of Gilgamesh and Two Late Plays by William Inge for Kaliyuga Arts at Bridge Street Theatre. Scrooge again, but in a new production of A Christmas Carol at Orlando Shakespeare Theater. Steven appeared in his third go-round as Scrooge in freeFall Theatre’s A CHRISTMAS CAROL. Last November Steven was featured in Half Moon Theatre’s production of John Cariani’s LOVE/SICK. In March of 2013 Steven traveled to Memphis to play Claudius in the Tennessee Shakespeare Company production of Hamlet at the Dixon Gardens. In March of 2012 Steven appeared as Officer Lockstock in the Great Basin College production of Urinetown in Elko, NV. Then in May he played August in the Kaliyuga Arts production of The Mound Builders. In July he was in Stageworks/Hudson's Play by Play - Redezvous. 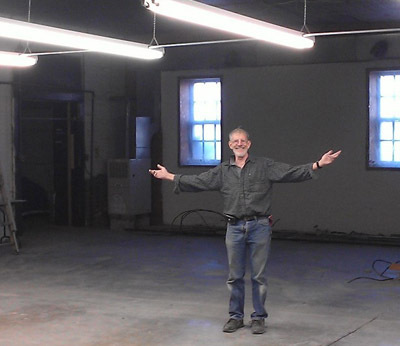 In October he was in the Chenango River Theatre's producion of Steven Dietz's Yankee Tavern. And he returned to St. Petersburg in December to reprise the role of Scrooge in freeFall Theatre's A Christmas Carol. In December of 2011, Steven appeared in A Christmas Carol at freeFall Theatre in St. Petersburg, Florida. He played Ebenezer Scrooge in a new musical version of the Christmas classic. Steven also appeared in the world premiere of The Cabbage Patch at the Depot Theatre in Westport, NY, which opened on September 9, 2011. More information at depottheatre.org/cabbage-patch. In December he will be appearing as Scrooge in the freeFall Theatre production ofA Chrismas Carol.